The central region of Chile offers travelers a balanced blend of culture and scenic vistas where the traditional and modern live side by side. Inside of the artsy and bustling neighborhoods of Santiago, find deep history, green park oases, and caring people. Just outside of Chile’s largest city, find ocean to the west, mountains to the east, and wine valleys to the south. The nearby bohemian port city of Valparaíso draws artists and adventurers to its cascading hills, while the nearby wineries draw aficionados and soon-to-be wine connoisseurs alike. While for many this central region of Chile becomes an afterthought when planning an adventure in Chile, it offers so much in and of itself that it’s worth exploring. There is a little bit of something for everyone, and spending more time here can add a deeper understanding of the country. You can explore the sites of the central region based most anywhere in the cities or countryside. Knowmad suggests when possible at least a two-night stay in the central region to avoid a choppy flow by having to switch hotels frequently. Time in the central Chile region often works well for a buffer on arrival in the country or before international flights out. As regional flights within Chile also hub like the spokes of a wheel, the central region can be a unique break between nature lodge stays such as in Patagonia or the Atacama Desert as well. The temperate climate makes for a year-round destination. Below we highlight three of our favorite places to base yourself while diving into the experiences of central Chile: Santiago, Valparaíso, and the Casablanca wine valley. As the distance between Santiago and Valparaíso can be as short as a 90-minute drive, it’s easy enough to spend a bit of time in each of these places, so ultimately the decision on where to call ‘home’ for a few nights will come down to your primary interests. As Chile’s largest city, Santiago is a destination in its own right. Santiago beckons to travelers as the metropolitan hub in the heart of Chile, which holds a myriad of experiences right at your fingertips within only a 2-hour drive. Rather than just passing through, tap into the city’s energy. The majestic architecture of the governmental buildings and the pedestrian streets intermingle to create a city soaked in deep history. Dive into over 35 distinct neighborhoods. Staying each evening in sophisticated Santiago gives the best access to blossoming restaurant scene striving to make the city a culinary destination, as well as world-class museums such as the Pre-Columbian Museum or The Fine Arts Museum. While wandering the paths of parks, you can find panoramic views of the city crowned by mountains. With glitz for the chic and urban, parks for the active and earthy, and art and music for the cultured, this city can cater to any style of travel. It can also be flexible to all budgets. A big city filled with many neighborhoods, the answer to “What to do in Santiago?” can be almost anything you want. Santiago’s central location and the airport make a very convenient base for day trips throughout the region as well as connecting seamlessly to the rest of your trip itinerary. If you only have one night in the region, it is hands-down the best in terms of accessibility and experience for a quick stop. Santiago is also the easiest place to explore independently compared to other destinations of the central region. To explore urban landscapes, base in Santiago. It can make for longer days if doing day trips to both Valparaíso and wine country (due to drive time), but it also gives you a snapshot of so many aspects of Chilean life with the variety of day activities available. Day 1 Arrive Santiago. Enhance your experience with a local guide. Day 2 Day trip to Valparaíso and/or a nearby vineyard, or continue to explore the city. Day 3 Day trip + depart Santiago. *One of our favorite neighborhoods is Lastarria, where restaurants, world-class museums, and urban parks are all at your fingertips. Valparaíso exudes a bohemian vibe, choc-full of architectural intricacies and historic cultural significance. This UNESCO World Heritage Site holds vivid colors and rich textures, with street art and graffiti murals done by internationally-renowned artists scattering the streets. As a port city, it has a little more organic ‘grit’ to it than the capital Santiago, but with constant spectacular views of the harbor below. The hills cascading into the bay are perfect for wanderers, and the best way to see the city is by walking, as the snake-like streets are harder to navigate than the pedestrian walkways cutting the hill sides. This is a great city for the more active traveler who is ready to get their steps in. Find surprises around every corner. Valparaíso is also connected to sister city Viña del Mar, known as “the garden city” for its lush gardens and palm-lined boulevards. Find poetry-inspiring vistas atop the hills, shop for handicrafts in local artists workshops, and enjoy the photographer’s paradise of the brightly colored buildings. Perhaps continue your exploration of art and culture by visiting Pablo Neruda’s house, lingering over his art collections as well as his poetry. A visit to Valparaíso can be a part of your time in the central region for nearly all itineraries. Only about a 90-minute drive from Santiago, it’s great as a day trip but also a very unique place to stay. Our favorite hilltop Cerro Alegre is crowned with great boutiques in reclaimed 1920s mansions and restaurants highlighting fresh ingredients caught off the coast. To wake up with an ocean view, overnight in Valparaíso. Valparaíso is also ideal for those with an interest in street art, poetry, and photography. With wine valleys in between Santiago and Valparaíso, you can get a quick taste of Chilean wine country traveling between the two cities, without having to go much out of the way. 2 nights in Valparaíso is a great addition to a Chile trip. Day 1 Arrive Santiago and drive to Valparaíso. Day 2 Awaken your senses with the colors of Valparaíso. Day 3 Depart Valparaíso. On the way to your next destination, snag a delicious lunch at a winery in the Casablanca valley. Chilean wine country is much like the central heart of the country – not only in terms of location, but also of culture. Some of the best of Chile’s wine country is possible to access right from Santiago. With a blend of family-run boutiques and world-known productions, Chile’s wineries have something for everyone, from those who are casually interested in dipping their toes into wine to a sommelier. Casablanca has a prime location midway between Santiago and Valparaíso, perfect to use as a hub for exploring much of the central valley. Maipo has more hotel options, but is less centrally-located. In the Casablanca valley specifically, cool-climate, artisan style reds and whites are the ticket. Nestled in the valleys between the Andes and the ocean, Casablanca’s location creates a land of flavors distinct to anywhere else in the world. Not to mention, while visiting these vineyards you will enjoy gourmet meals while taking in the beautiful surroundings. The beauty of Chilean wine country is how quickly you can move from the urban capital to the gorgeous views of rolling hills covered with vines. Staying in wine country generally lends itself to a more restful trip, and is ideal for those seeking a slice of heavenly tranquility to return to each night. Eat, drink, and relax is the motto at Chile’s vineyards. Matetic Vineyard offers one of Casablanca’s top options, and has the benefit of on-site activities, including guided cycling rides, and horseback riding through the vineyards. However, basing yourself in wine country as opposed to a city like Valparaíso or Santiago does come with a higher price tag, and with fewer hotels to choose from there can be limited availability. Additionally, if your primary interests lie in Santiago’s city life or Valparaiso’s art scene and seafood, basing yourself in wine country could mean additional driving time to visit the cities. Not only for romantics, a stay in wine country can be a refreshing breath of fresh air on any trip to Chile. Day 1 Arrive Santiago and drive to wine country. Day 2 Relax at your vineyard property, or plan a day trip to Valparaíso. Day 3 Top it all off with a glass of Chile’s signature wine, Carménère, before you depart wine country. ¡Salud! For a more extensive wine country stay, you can also venture into the further south near the Colchagua Valley. Here you’ll find world-class accommodations, but these spectacular vineyard hotels will require additional room in your budget. Has Chile caught your eye? Are you looking for the best combination of regions and advice on how to put-it-all-together? 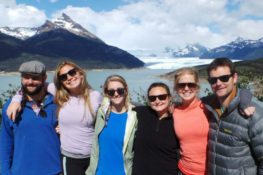 To plan your own custom Chile itinerary, give your Knowmad Chile Trip Specialist a call today at 612-315-2894 or send us an email.